The chords boom from a piano at Brooklyn’s High School of the Arts. Travis Maynard, a 16-year-old who raps under the pseudonym Savage, spits vivid lyrics about the hardships of urban life. Forty of his classmates nod along to the beat, shout approval at his deft rhymes and burst into applause when he’s done. From the behind the baby grand, where his hands glide over the keys, concert pianist Soheil Nasseri smiles. “By the time the rap jam session is over, the kids have so much adrenaline rushing,” says Nasseri, who just finished the third year of his program that brings classical music to New York City schools. Students who have seen Nasseri’s workshops get tickets to his recital tonight at Alice Tully Hall at Lincoln Center. There, he’ll give the world premiere of Martin Kennedy’s Piano Sonata, plus perform works by Franz Liszt and Felix Mendelssohn. Nasseri, 25, has lit a fire. 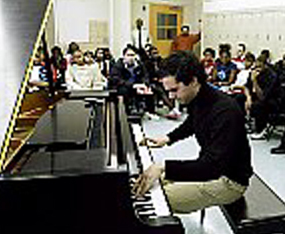 After he finishes an explosive, showy piece by Liszt – “He was a real rock star, you know,” he tells the students. “Women would throw jewelry at him, they would get so excited by his work.” – a boy with dreadlocks rockets to his feet to give the performer a heartfelt standing ovation. “Emotion is not very present in most pop music,” says Nasseri, who has played the piano since he was 5, but listened to Ice Cube, NWA and Snoop Dogg growing up. The son of scientists got into music in a big way when he was 16, dropping out of his Maryland high school during his junior year so he could concentrate on his craft. “I had then what I often refer to as a mental breakdown due to the antisocial nature of practicing 20 hours a day,” says Nasseri. He moved to New York at 21, cultivating a social life at hot spots like Lotus and Bungalow 8. A chance dinner with Roc-A-Fella Records founder Damon Dash inspired the pianist to fuse hip hop with classical music to educate rap-obsessed youth. But Nasseri prefers to tell the students about the time Dash sent him 10 Roc-A-Wear outfits, one of which he promptly wore for a night out. “And you wore those shoes?” asks one boy, pointing at Nasseri’s black-leather, buckle shoes. “You don’t like my shoes? But they look okay with my outfit today, right?” asked Nasseri, dressed in a classical piano man’s straight-laced gear. “I kind of like it when these kids tease me,” says Nasseri later.